Our touch sense, or tactile sense, is a sense that most people are familiar with. It is one of the five senses you would have been taught about in school. The touch sense responds to anything that touches the skin. This could include light touch, discriminative touch and touch pressure. We will discuss these different types of touch below. The skin also responds to sensory messages regarding pressure, pain, temperature and vibration. Be precise with our motor skills, especially using our fingers and also talking! It is important to remember that the touch sense is different to proprioception. Our proprioceptors process sensory information is coming from our muscles and joints and not our skin. The touch and proprioceptive senses work together to coordinate with our movements. 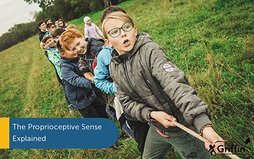 You can learn more about the proprioceptive sense here. Did you know there are three different types of touch! Discriminative touch is also called fine touch. This part of our touch system provides very specific and detailed information about what we are touching or where we have been touched. If you think back to the spider web example, the light touch system would know something unpleasant is touching your arm and make you move. The discriminative touch pathway will tell the brain that what touched the skin felt sticky. From your previous experiences your brain could figure out it was likely a spider web. Then, when you feel your arm to find exactly where the spider web is and take it off, that’s also your discriminative touch pathway working. This pathway is also very important for accurate and precise fine motor skills. It is thought to be important for the development of motor planning, or praxis, too. Touch pressure is firmer touch or a squeeze. It is sometimes called deep touch pressure. It works alongside the discriminative touch pathway. A good example is if you receive a hug. Your discriminative touch pathway tells you where the person is touching you but you also feel how hard they are squeezing. That sensation of how soft or hard they are squeezing is called touch pressure. Another example would be when you tighten your shoes, you know if they are too tight or loose by the amount of pressure they are putting on your feet. Also, if you are under a heavy blanket, you can feel the pressure it is putting on your skin. What might it look like if our touch sense isn’t working well? When the touch sense doesn’t process the sensory inputs it receives very well there are three typical sensory challenges: sensory modulation; sensory discrimination and sensory movement. 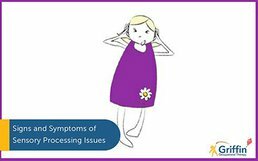 We discuss these different sensory challenges in more detail in our post ‘What is Sensory Processing Disorder.’ Here we will consider how these sensory processing difficulties affect the touch sense. 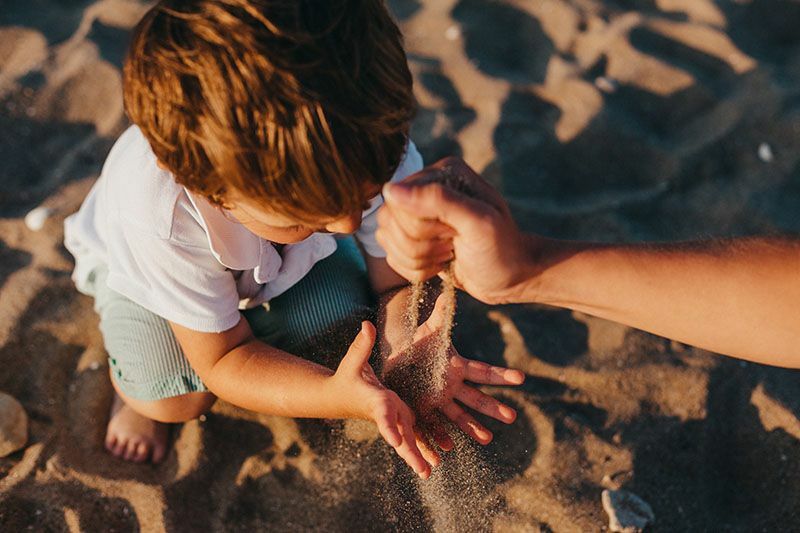 If you want to read more about touch sensitivity – or tactile defensiveness as it is called by occupational therapists – please check out our next post – What is tactile defensiveness? Touch or tactile discrimination is all about the ‘What’ and ‘Where.’ What is touching me, what does it feel like? Is it hot or cold, dry or sticky, hard or soft, sharp or blunt? What shape is it, is it big or small? Where is it touching me? On the foot or toe? The hand or finger, elbow or arm, forehead or chin, or the back or front? Touch discrimination gives our bodies all of the detailed information about what we are touching and where we are being touched. It is touch discrimination that allows us to put our hand into our pocket and pull out the £1 coin instead of a 50 pence coin. Our hand can feel the different shape of the coins and pull out the right one. The same is true if you put your hand into your bag to find your keys, your fingers can feel the difference between your keys and your wallet; you can discriminate between the two. You may be thinking what does the touch sense have to do with dyspraxia? Whilst researching Sensory Integration, Jean Ayres discovered that poor touch discrimination was linked to dyspraxia. In her final model, she included poor ability to locate touch and an inability to recognise object shapes by feeling them as signs of dyspraxia. She thought that because the touch sense helps to create the map of our body (called body schema) within the brain, it was essential for children to learn how to then plan and organise their body movements. Why is our touch sense important for learning and participation? If you want to be successful at learning at school, you need to have good fine motor skills! You need to be able to hold a pencil, to be able to open your lunch box and do up your buttons and to cut with scissors and open up glue. It is our touch sense that supports our fine motor skills and allows us to do all of these activities successfully. Our touch sense also helps with self-regulation. Mothers, for example, comfort babies with their touch. Even as adults, hugs often still help to comfort. Children and adults that have difficulty modulating touch sensory inputs may be more distracted by touch. This could include finding wearing their school uniform a challenge. Or they might join in less with messy play or other learning activities. So, there you have it, everything you need to know about the touch sense if you are trying to help a child or adult who has a sensory processing disorder. You may want to also check out our next post about touch sensitivity (tactile defensiveness). And don’t’ forget to, subscribe to our newsletter to make sure you (forgive the pun) stay in touch!